You have Fleas? The Pest Force has the solution. Maybe your dog is scratching, maybe you are scratching, maybe you have seen the culprit—fleas! These small, jumping nuisance pests may be found in your home or yard. If you suspect a flea infestation, but aren’t sure, put on a pair of long white socks and shuffle through the suspect room. The fleas, attracted to the brightness of the white socks will hop on and you will have your evidence. Or, if you prefer, place a pan of water under a night light in the room. The next morning look for fleas caught in the bowl. Certainly, as pet lovers, we hate to see our furry friends suffer. Worse yet is when you have to suffer because of a former owner or tenant. Occasionally the fleas are coming from wild animals visiting a crawl space! Whatever the source, The Pest Force has the solution. It is important that pets are treated for fleas at the same time the house and/or yard are being treated. Your veterinarian will be able to prescribe the proper treatment for your pet. If you do not have a veterinarian, we recommend Carolina Forest Veterinary Hospital, 843-236-7383. Ask for Dr. Kevin Kristick and tell him The Pest Force sent you. He has a treatment that can immediately eliminate fleas from your pet and has programs for flea control if your pet will be leaving your property after treatment or coming into contact with other animals. For home treatments our Customer Service Specialist will schedule an appointment at your convenience for a specific appointment time. You will need to vacate the dwelling for 3 hours during treatment, so plan and schedule accordingly. In preparation for your treatment as much of the carpet and cloth furniture should be cleared of clutter as possible. Within 48 hours of the scheduled appointment your home should be thoroughly vacuumed and attachments should be used to reach the cracks and crevices of furniture. This is key to a accomplish a successful treatment. Not only will the vacuum pick up eggs, larvae and fleas, the vibration of the vacuum will trigger fleas to exit cocoons, exposing them to treatment. Dispose of the vacuum bag or canister contents in an outside trash receptacle immediately after vacuuming. Wash all pet bedding (including your bedding if the pet sleeps with you). 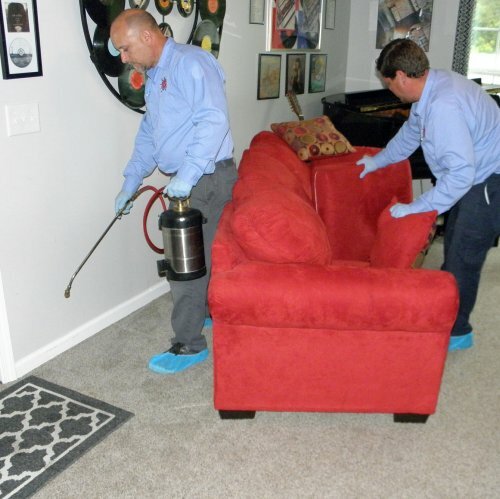 If you are unable to vacuum before treatment, The Pest Force can do this for a small additional fee—be sure to ask for this service when you schedule. If you do not have pets and yet have a flea infestation, we will find the source of the problem as well as treating the problem. When you return, you may notice that things have been moved around in order to completely perform the treatment. The carpet should be dry if you have been gone for the allotted 3 hours, but if it is still slightly damp, do not walk on it until it is completely dry. There will be notes about what was found and what was accomplished. Because of the life cycle of fleas, a 2nd treatment is required 2 weeks from the 1st. During those weeks it is important to vacuum often, emptying the canister or bag each time. You may see a few fleas up to two weeks after the 2nd treatment as the final insects exit their cocoons and are exposed to the treatment. If you see any fleas after 2 weeks you should call The Pest Force. The flea treatment has a 30 day guarantee which starts 2 weeks after the 2nd treatment. Fleas are a common yard pest in South Carolina and may be the source of your flea problem. The Pest Force recommends a yard treatment any time fleas are a problem in your home and can perform a yard treatment to eliminate fleas. The scheduling process is the same as for a home treatment and people and pets must remain off of the lawn for at least 3 hours. In preparation for the treatment you should mow your lawn, remove leaf and grass debris, and pick up clutter as well. Two treatments are required in order for The Pest Force to guarantee the treatment. As with a home treatment, pets should be treated at the same time. We also offer a yard maintenance program to keep your lawn flea free year round. The Pest Force can inspect and treat every 4 months to protect your yard from fleas. Quarterly customers who elect to be on a flea program receive a significant discount as part of their program. The Pest Force services the following areas for Flea Treatment: Myrtle Beach, North Myrtle Beach, Little River, Longs, Conway, Carolina Forest, Socastee, Surfside Beach, Garden City Beach, Murrells Inlet, Litchfield Beach, and Pawleys Island.